Thanks to a little-known Death Metal band from Florida that you may have heard of, Industrial influences in metal have taken rather a knock of late. I can’t imagine why – however badly said influences may have come across in that case, the fact remains that those influences themselves have very little wrong with them. The merging of machine and Metal has long been an obsession with many, often to a great degree of success – say what you like about Fear Factory, but Red Harvest’s post-apocalyptic take on the genre was little short of brilliant. Meanwhile, the master and commander if not outright inventor of the genre Justin K Broadrick has gone unhailed by many, lulled into a false sense of security by his fairly nice Jesu project and forgetting that his prior project Godflesh was, in many ways, Industrial Metal at its most perfect. The band were always kings of industrial, influenced by early pioneers such as Whitehouse and Swans, with Broadrick gaining enough underground fame to be even offered places in Faith No More and Danzig! Despite this, Godflesh is hardly a name on the lips of many. Everyone knows of Streetcleaner, of course, from the sheer amount of magazine best-of lists that it manages to get its filthy claws into, but what of the band’s other albums? Well, without detracting from Streetcleaner’s eternal value one iota, I wish people would remember that Godflesh have released six albums to date (and more may be on the way, in the most exciting news ever!). I will sing the praises of 2001’s Hymns and 1996’s Songs Of Love And Hate another day, but Pure, the follow-up to Streetcleaner, is just as worthy of attention as its illustrious forefather. Ignoring (unfairly maligned) EP Slavestate for the moment, this is where Godflesh went from alt-grind curios to a project deserving their own kudos. And whilst Pure may not have the exact perfect combination of elements that makes Streetcleaner such a classic, it’s still a damn great album. Never forget this band’s roots – Broadrick was guitarist for Napalm Death once upon a time, and in Godflesh turned the fast noise of that band on its head by being deliberately slow. Going from Mick Harris’ blastbeats to a hip-hop influenced drum machine, Broadrick seemed determined to oppose everything that gave Napalm Death its name. Oh, yes, your eyes didn’t deceive you. Hip-hop rhythms and beats were very much an influence on Broadrick, who is on record as crediting the beat on Christbait Rising to Eric B & Rakim. Which is better than giving the likes of 50 Cent a shout out, but still is hardly the true bloodline that Metalheads of a certain persuasion demand. They’d probably hate Pure, too, the silly sods, missing out on a fantastic album. If Streetcleaner was the sound of a city slowly and malevolently destroying its human inhabitants, then Pure is the sound of said city relaxing back into its urban rhythms, factories and roads echoing with their own curious pulse of artificial life. It’s more of a mechanical-sounding album than the desperate roar of a dying species that is Streetcleaner. The distant screeches and wails are all but gone, replaced by precisely clunking, perversely danceable beats and riffs. As opener Spite shows, the anthemic qualities to Godflesh’s sound begin here, refined and purified into conveyor belts of hypnotic grooves. The driving intensity of Mothra is like an attempt at replicating Ministry by alien lifeforms who don’t really understand what music is all about. That sense of inhumanity, the cold, alien mechanical sound, is what makes Pure, and Godflesh, the genius musical experiments as they are. It’s a surprisingly deep, complex sound, the clean vocals and subtle electronic flourishes of I Wasn’t Born To Follow seemingly the only difference between it and other tracks – don’t listen to this album if repetition annoys you. You’d be missing out on some brilliant work, however, the strange catchiness of Predominance amongst others something that stays with you after the album’s over. By then, however, you’ll be in a whole different mindset, as Pure’s peculiar flow winds down the catchiness, past the grooving riffs of Monotremata and the menacingly ‘nice’ melody of Baby Blues Eyes, which is surely one of the most misleading song titles in history! Pure moves unendingly on with strange grace, through the atmospheric dirge of Don’t Bring Me Flowers and the coruscating noise of Love Hate (Slugbaiting), two excellent tracks that deserve paragraphs in their own right – you can tell an album’s brilliant when you’re forced to cut down on the review. It all, eventually, ends with the ambience of Pure II, a twenty-minute long piece that’s always seemed, to me, to be the aural depiction of a snoring train station, distant screeches and whistles echoing as engines chase each other in the building’s dreams. Fans of Broadrick’s Final project will find much to like, but then those who have heard of that won’t need to be told how good Godflesh are anyway! 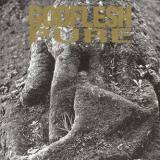 Ultimately, Godflesh was not a good experience for Broadrick, who suffered a nervous breakdown before a tour in 2002, resulting in its being cancelled and his being forced to sell his house and get into heavy debt to cover the costs. The man has suffered for his art, and in a genre where living rough and playing thousands of shows before empty, unappreciative audiences is the norm, that’s saying a lot. Pure may not quite be a classic, as mentioned, but it’s certainly a fine album, and a perfect example of what industrial plus metal should equal in terms of quality, timeless spirit, and sound.